Wedge Worldwide carries a wide selection of fun, non-toxic toys. Recently, we have brought in even more heirloom quality toys with finishes that are safe for little ones; like our beautifully hand-made Five Piece Train Set. The locomotive, passenger car, cargo car, tank car and caboose can all be taken apart and reconnected in a variety of configurations that will provide hours of creative play. Another great new item is the super cute Little Rollie Vehicle Set. These smooth rolling, durably designed toys are well-suited for active play. Both the Train Set and the Vehicle Set come in all natural wood tones that are finished with a food-grade, non-toxic, natural oil. Our vendor tries to use reclaimed wood whenever possible, and 100 percent of the electricity that runs their shop comes from wind and/or solar energy! Other new playthings at Wedge Worldwide include the colorful and mesmerizing Domino Race game by the German Toy company HABA. This game comes with a wide assortment of bright dominoes, animal-shaped dominoes, domino bridges and even a little bell that rings when dominoes under it are knocked over. We have to admit that the adults in our office here were very tempted to play with this! Also from HABA, we carry the Ball Track Construction Set, an elaborate block set that allows you to build your own tracks for marbles to wind their way through, and the Colored Peg Set, a small, travel-ready game that encourages the development of fine motor skills in a playful way. 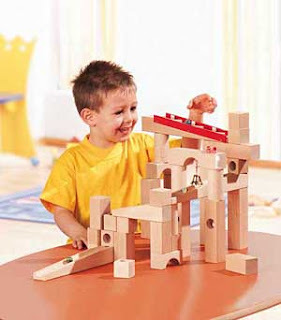 HABA products meet the strict requirements of the European Safety-Standard for toys. Their toys are regularly tested, and the company must continually pass European certification guidelines that guarantee their toys are of high quality, meet safety standards and fulfill environmental guidelines. HABA is the first toy producer in Germany to have passed the audit for ecological friendliness, and they are deeply committed to actively pursuing further environmental protection throughout every stage of production. All HABA items offered through Wedge Worldwide are produced in Germany using first class non-toxic varnishes and colored stains that never chip or peel. The materials they use for colored surface treatment of toys and their clear varnishes are fundamentally water-based and therefore, do not contain any harmful solvents. We're proud to be your online source for eco-friendly, fairly made, safe toys!